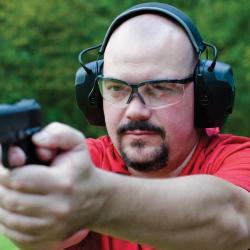 Hearing protection is not exactly a glamorous thing to talk about. It is pretty unlikely that in the fancy parties with finger sandwiches, they are conversing about the exciting world of hearing protection devices to prevent noise induced hearing loss. At least I don’t think they are, but I wouldn’t know – I am not usually invited to such parties. Though it may not be the sexiest topic to talk about, it is extremely important because while most of us would probably say that our vision is our most important sense, our hearing affects our life just as much. Having good hearing definitely makes this already confusing world a little easier to navigate. Therefore, it is advisable to do our best to avoid noise-induced hearing loss. In the olden days, one had to compromise situational awareness for hearing protection, which made people less likely to wear noise reducing ear-ware when shooting. However, with modern technology that is simply not the case anymore, and these Howard Leight Impact Pro Earmuffs show just how far we have come. The results of noise induced hearing loss aren’t exactly what you think they are; it doesn’t just mean that conversations and sounds are a bit quieter. What it more commonly entails is that in terms of volume, your hearing is the same, but in terms of clarity, the quality is greatly diminished. High frequency sounds are usually the sounds that are most affected when it comes to this type of hearing loss. That mostly includes consonant sounds such as “s” “th” “t” “c” and quite a few others as well. It may be a bit less noticeable day-to-day because you work and live with the same people. Therefore, you can use other cues to fill in the blanks. However, this could be extremely frustrating especially in instances when you do not know the speaker and have much more trouble filling in the gaps. This can definitely affect your quality of live for the negative. So what makes these Howard Leight electronic earmuffs different from other noise reducing headphones on the market? The answer lies squarely in the name itself. They are sound amplifying. Now this may sound confusing because they are supposed to be noise reducing headphones, but that is exactly the point. There is a difference between sound and noise, and these headphones reduce one and amplify the other. Sound is simply what we hear – all of it – and noise is specifically the unwanted sound that we hear. Simply put, the Impact Pro earmuffs block unwanted gunshot sounds, and clarify as well as amplify the conversation or commands that are going on around you. Pretty cool, huh? Sometimes the idea of something is more exciting than its application. That is not the case with these. I took these out to the range a couple of weeks ago, and there were quite a few people at the range that day. 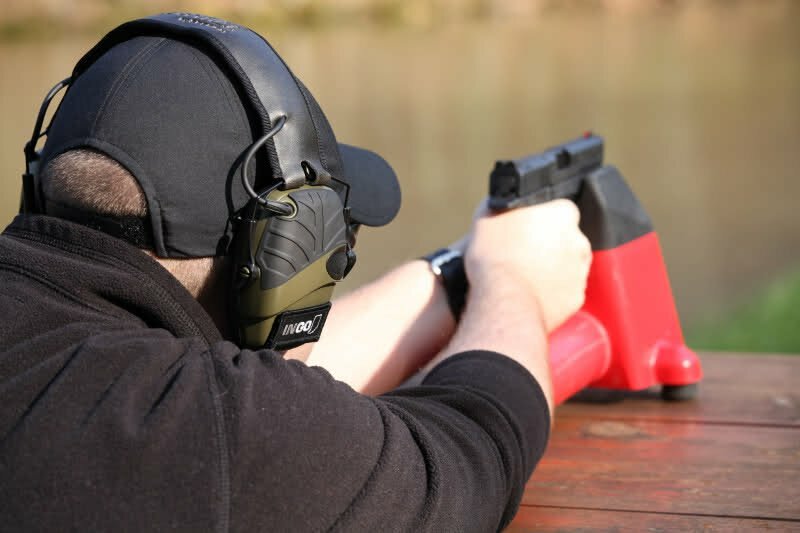 I normally keep largely to myself when I am at the shooting range, because I will not compromise ear safety for good conversation – but oh did I feel like I was losing out, since the conversations at the range are so good. There are few places people are more likely to spill the gory details of their lives than at the range. I used to miss out on that and other pleasant conversations. Anyway, I brought my Baby Glock to the range for the day and spent quite a few hours doing some target practice. 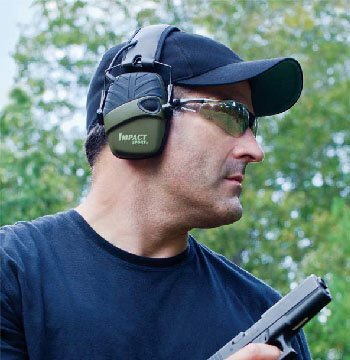 With this Howard Leight Impact Pro Sound Amplifier, the noise from the handgun was significantly diminished, but I heard the command officer and other conversations better than if I wasn’t wearing these impact earmuffs. The specs on these electronic earmuffs are pretty impressive. At just 1.15 pounds, they are lightweight but powerful. They block harmful noise over 82 decibels and have a noise reduction rating of 30, which is one of the highest noise attenuations on the market. Stereo microphones clarify and amplify low level sounds like regular human voices 4x. Which would probably explain why I can hear low level sounds better with these on than without them. As for comfort and fit, these Howard Leight earmuffs feature an aggressive tactical styling which means they are comfortable but also durable. The feature also comes with rubberized pressure points to prevent the gunstocks from getting damaged. I may be an avid shooter, which does take some technical prowess, but I am actually not that technologically savvy and I appreciate that all the features and functions on this pair of Howard Leight R-01902 are easy as moving a switch from on to off. There is a single on/off knob on one side that also controls volumes, and it controls both sides. The impact pro is easy to fit. It is adjustable and fuss free in this way. 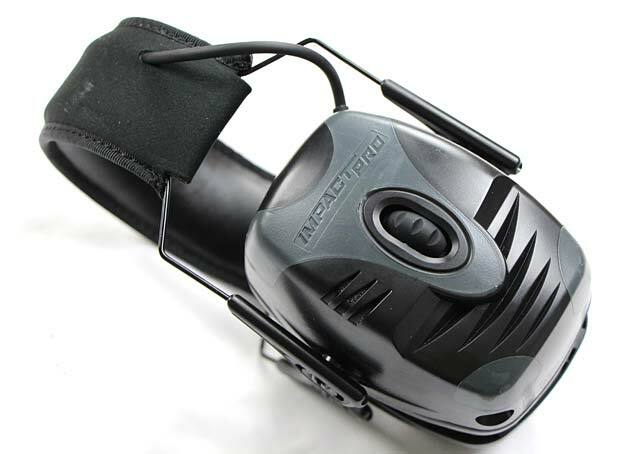 The Impact Pro has an easy-access external battery compartment that takes 2 AAA batteries and lasts 350 hours. It also boasts an automatic shutoff after 4 hours. They have another great feature which is an audio input connection cord that allows you to connect your phone or mp3 into these muffs. 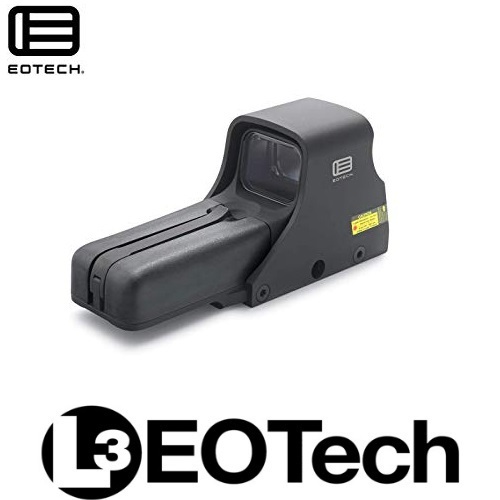 The Impact Pro shares many similarities with the Howard Leight Impact Sport, but the Pro is a thicker style and often used in conjunction with pistols, while the Sport is geared more towards a rifle or shotgun. I am really impressed with this pair of Howard Leights by Honeywell; the sound amplification is extremely high quality. I can hear what I need to, such as human voices or tree branches breaking, and I am more than adequately blocked from what I don’t want to hear, namely gunshots. Another great time to wear these is while mowing the lawn. I hate how loud our lawn mower is and standard earbuds I use with my mp3 player are not good at blocking out the sound; they just add a more pleasant competing sound. But the Impact Pros block out the annoying lawn mower sounds and I can listen to my music as well. In short, these are a great pair of shooting muffs that are well-made and certainly give you a tactical advantage. 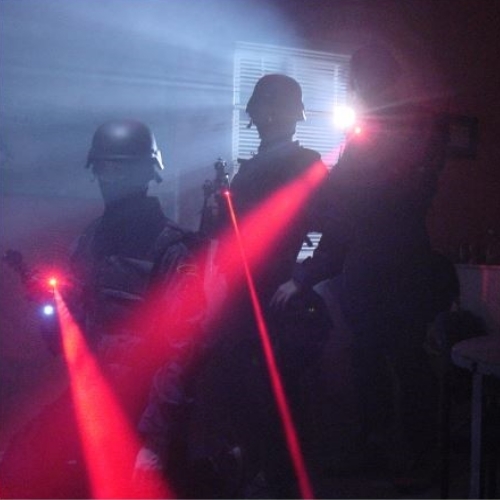 Whether you are a police officer or hobbyist, these do the job.